Slovenian households consume about 20 % of final energy. Consumption has decreased since 2003, mainly due to usage of petroleum products for which consumption decline in 2009 by 40% compared to 2003. Most of the energy is used for heating the households, followed by the consumption of energy for DHW heating, electricity consumption for other purposes (for lighting, for electrical appliances ...) and consumption of energy for cooking. The indicator shows the development of the final energy consumption in households and the structure of consumed energy with regard to the energy source or fuel and the type of use. Final energy savings in the period 2008 - 2016 by 9 percent or 4,261 GWh by implementing the planned instruments within the framework of the NEEAP. The household sector measures represent 1,165 GWh (27%). - 20% of the energy consumed by the EU must be obtained from renewable energy sources. Slovenian households consume around 20% of final energy, including the processing activities and construction, just over a half. Final energy consumption in households has been decreasing since 2003, mainly on account of petroleum products, consumption of which fell by 40% in 2007 compared to 2003, when consumption was the highest. Reduced use of light fuel oil in 2007 was most likely a consequence of the growing prices and consequently postponed purchase of fuel. After 2003, consumption of other types of energy has been more or less the same. In this period, some fluctuations were noted only with regard to natural gas and heat. In 2007, a million toe (ton of oil equivalent) of energy from various energy sources were consumed for the supply of households, 31% of which were from renewable sources (including hydroelectric power plants) and waste, 27% from petroleum products, 25% from electric energy, and 9% from natural gas and heat with the same share. According to the latest data available (SORS 2002), Slovenian households consume most of the final energy for space heating (53%), cooking (25%), and water heating (13%). The National Energy Efficiency Action Plan for the period 2008-2016 describes the set of instruments that will improve energy efficiency in households, mainly in heating and final energy consumption. However, their implementation depends on the provision of funds and the information provided to the consumers about the possibilities and benefits of efficient energy use. The package of fiscal incentives includes four programmes: for energy-efficient renovation of buildings and sustainable construction of buildings, energy-efficient heating systems, efficient use of electric energy, and the energy efficiency scheme for low-income households. 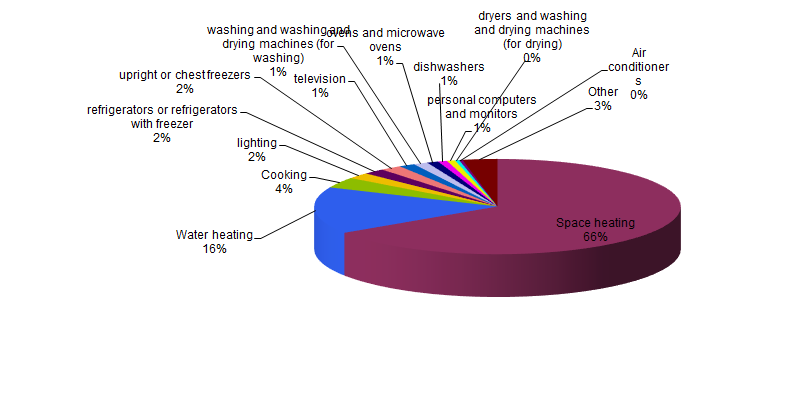 In EU-25 households (EEA Report 2008) most energy is consumed for space heating (70%, water heating (14%), and electrical appliances and lighting (12%). In most of the EU-15 Member States, the general efficiency of space heating in households has increased in the last 15 years, mainly due to improved insulation and prevention of heat loss. However, these improvements have been more than nullified by the growth in the number and size of dwellings and increased average temperatures. Electric appliances and lighting also provide possibilities for improving energy efficiency. Some light bulbs consume from 30% to as much as 80% less energy than they used to. - The National Energy Efficiency Action Plan for the period 2008-2016. The objectives are in line with Article 4 of Directive 2006/32/E:, to achieve 9 percent final energy savings by implementing the planned instruments comprising the measures for the efficient use of energy and energy services, and are in compliance with the starting-points of the Resolution on the National Energy Programme and Directive 2006/32/EC. - EU Action Plan for Energy Efficiency. Source database or source: Statistical Office of the Republic of Slovenia, SI-STAT Database (Energy balance (1000 toe), November 2007; Final energy consumption in households by energy source; Energy Balance (1000 toe), July 2009). Methodology and frequency of data collection for the indicator: Annual data collection on energy balance and a 5-year data collection on final consumption of energy and fuels in households by energy sources. The data on the quantity and structure of final energy consumption in households by energy sources is derived from the SI-STAT Data Portal of the Statistical Office of the Republic of Slovenia, November 2007, the Energy Balance Dataset (1000 toe), Slovenia, annually. The data on the structure of final energy consumption in households is derived from the SI-STAT Data Portal of the Statistical Office of the Republic of Slovenia, July 2009, the Final Energy Consumption in Households by Energy Source Dataset, Slovenia, a 5-year collection. The data on the share of energy consumption in households is derived from the SI-STAT Data Portal of the Statistical Office of the Republic of Slovenia, July 2009, the Energy Balance Dataset (1000 toe), Slovenia, annually.